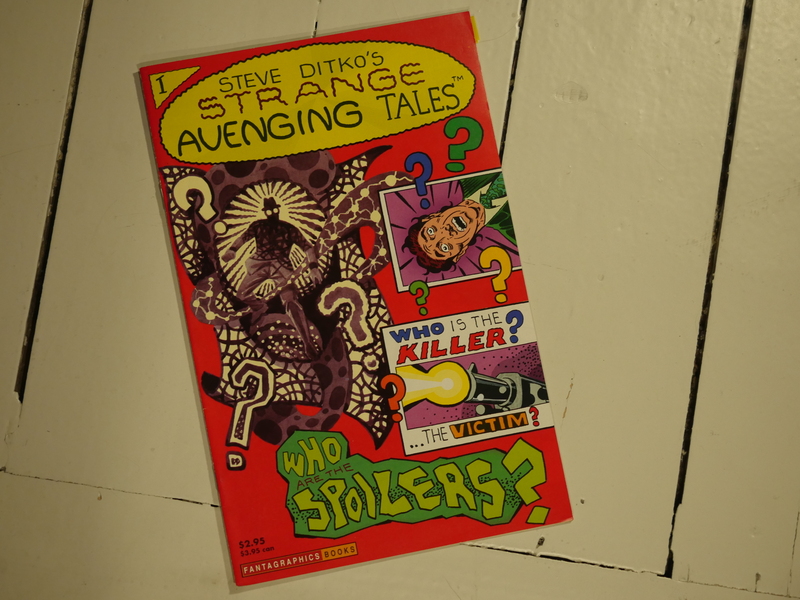 Steve Ditko’s Strange Avenging Tales #1 by Steve Ditko. 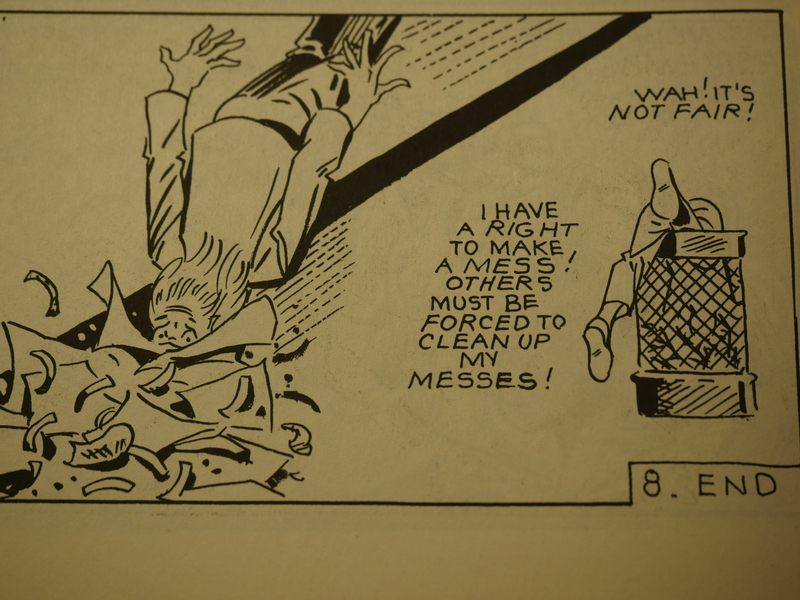 After leaving Marvel in the early 70s, Ditko has been publishing a stream of Ayn Rand-inspired comics at any publisher that would let him do whatever he wanted without any interference. 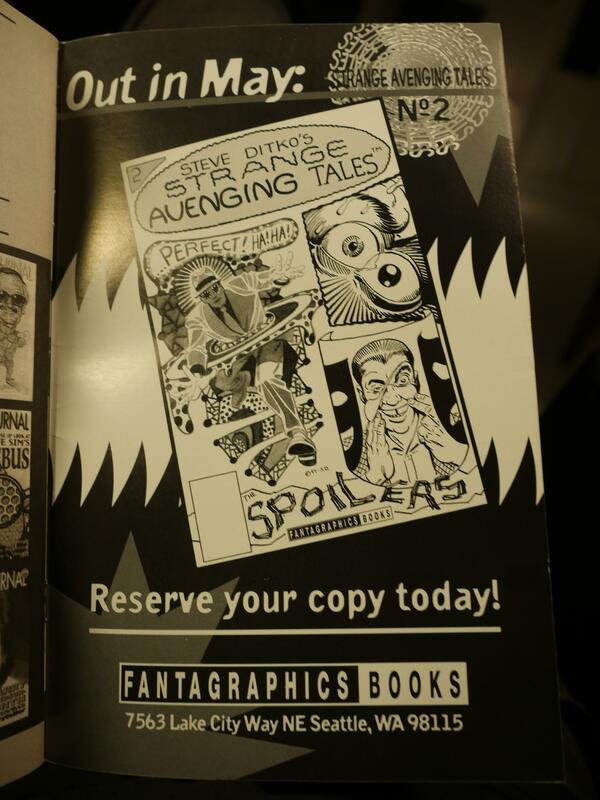 Strange Avenging Tales was apparently an attempt at doing one of these comics at Fantagraphics, but for (reasons unknown to me), only one issue was published. Most of the stuff I’ve seen from his post-Marvel period has been line drawings only, with little shading. For the lead piece in this comic book, he’s apparently using washes to paint in some greys? Looks pretty nice. The other stories are in his usual style: Very clean black and white. The stories are, like most everything I’ve read from him the past few decades, simple short stories where somebody does something wrong, and then horrible retribution arrives setting things straight. Here a litterer is junked. A one page philosophical treaty. There is something quite attractive about Ditko’s artwork. A blend of experimentation and old school drawing. I wonder why Groth put this page in. 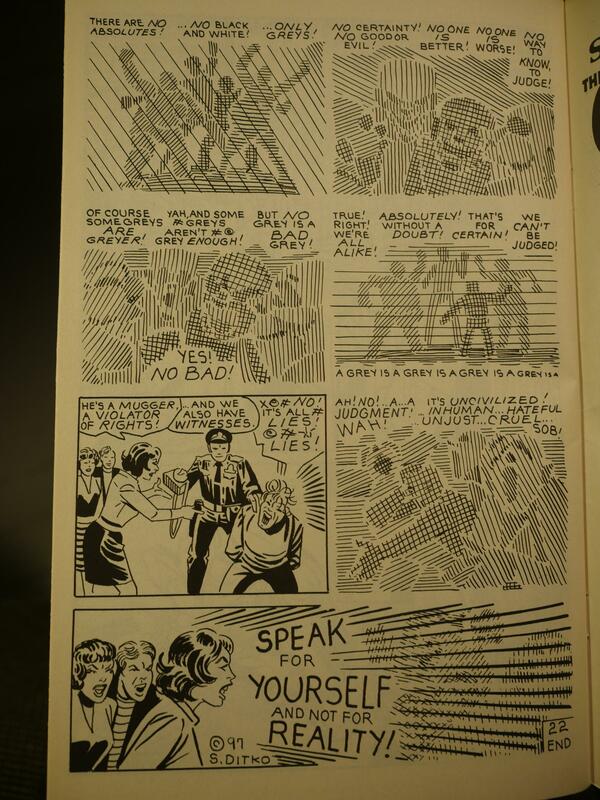 Ditko is known to be pretty prickly, right? 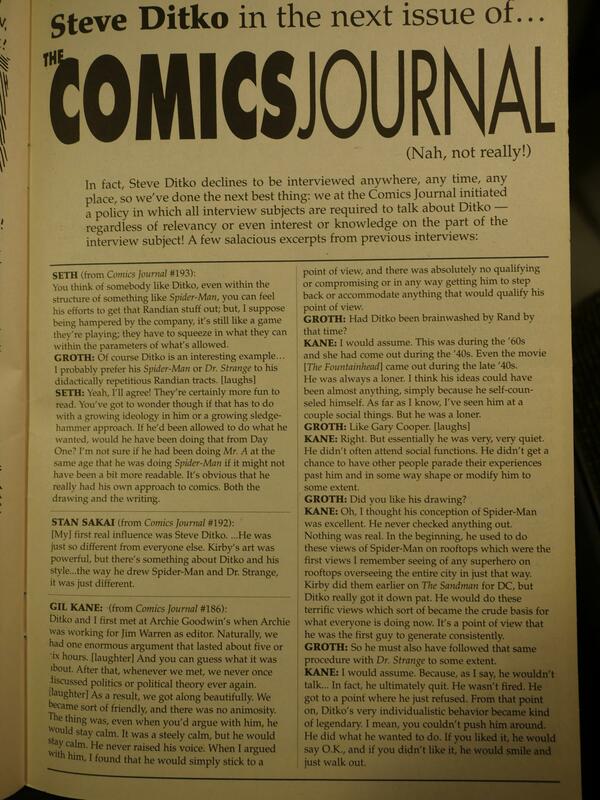 So why put a page of not very respectful quotes about Ditko into his own magazine? Groth is even quoted saying “didactically repetitive Randian tracts [laughs]”, which is probably not something that any artist would want their publisher to say about them. A second issue is announced, so they were probably going for a quarterly schedule. No such comic was ever published, apparently. 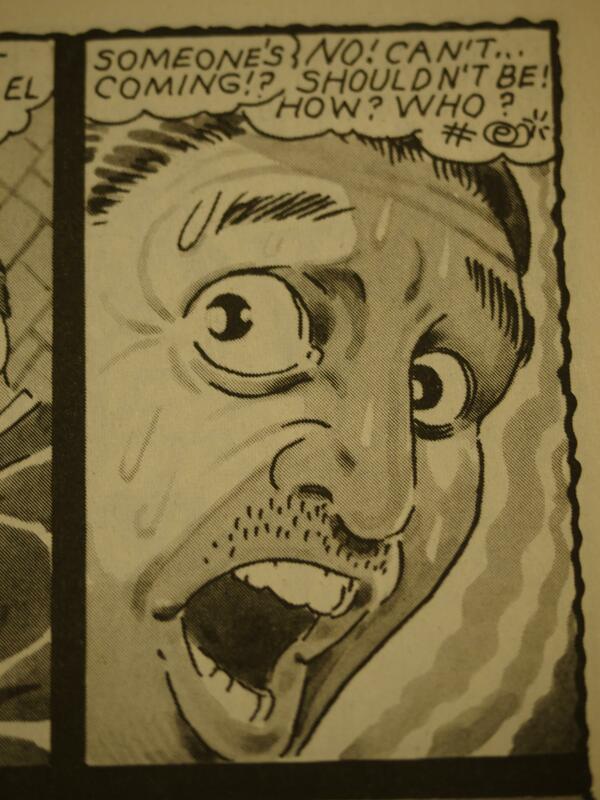 Ditko is still active to this day, and there’s probably a project being kickstartered as I type… Yup. A rolling kickstart campaign has been going for a few years now. I haven’t participated in any of them, because even if I like the artwork, I just find the stories to be repetitiously didactic.